Hell has come to the Globe Theatre for this production of Macbeth. Even the front few rows of the groundlings are forced to stand beneath a black tarpaulin, with just their heads poking out: the audience, too, is trapped in one of hell's frozen lakes. 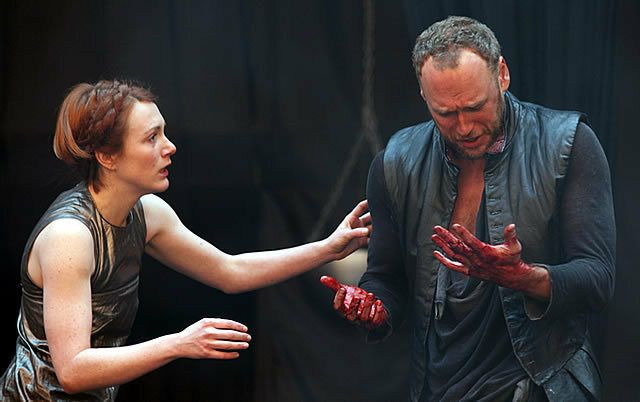 From this underworld, a pretty gruesome production of Shakespeare's Scottish play unfolds. Writhing, bloody, anguished torsos emerge from below the black stage; the excellent witches, Russian doll-like (one tall, one medium, one short) in blood-red robes also inhabit this netherworld. And each time a body is dispatched (which happens a lot), more often than not it's dropped through a myriad of trapdoors into this unworldly pit, where you get the feeling its torments aren't over yet. All this weirdness is balanced by a healthy dose of humanity in Duncan's court. The Scottish soldiers welcome each other with chanting and singing, like victorious rugby players. So when Macbeth takes up his unnatural king killing, the stilted stiffness between these former friends is classic indication of a world turned upside down. Into Lucy Bailey's hell-set production comes an extremely young power couple. Indeed if we have a quibble about this undoubtedly entertaining play, it's in the portrayals of Macbeth and Lady Macbeth. Elliot Cowan's Macbeth really does seem "too full of the milk of human kindness," as his wife suggests: his soft "s's", long skirts and scarves, and attractively touching descent into madness do not suggest a powerful Scottish warlord, famous for his brutality on the battlefield. He looks like he's about to go onstage with Coldplay. And we were similarly unconvinced by his missus: surely Laura Rogers' Lady Macbeth is too sweet to ever suggest killing anyone? Macbeth plays at Shakespeare's Globe Theatre until 27 June. Tickets from £5 to £35. Visit www.shakespeares-globe.org or call 020 7401 9919 for more information.